The Voice has quickly become one of our favorite singing reality competitions because the judges — while at times over the top and ridiculous — definitely have a good time and are even quite funny. 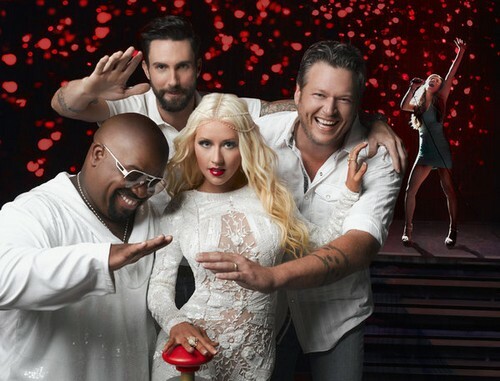 Tonight, The Voice season 5 will be returning for Part 4 of the Blind Auditions. Cee Lo Green, Blake Shelton, Christina Aguilera, and Adam Levine will all be fighting furiously to make sure they win over the best singers to represent them this season. While this is a competition for singers hoping to make a name for themselves in the industry, let’s not forget the fact that these judges WANT their teams to win. The “blind auditions” continue and are held in front of a celebrity panel of coaches including, Adam Levine, Blake Shelton, CeeLo Green and Christina Aguilera. The strongest vocalists from across the country compete to be selected by one of the coaches and fight for a chance to win the title of being named “The Voice.” Carson Daly (“Last Call with Carson Daly”) hosts. There was some amazing talent on last night’s episode. In case you missed it, check out our LIVE RECAP — CLICK HERE. Last night, we met the sister of Caley Cuoco (Big Bang Theory), and it turns out that she has a powerhouse voice. She ultimately ended up choosing Team Christina, and we hope she goes far, as she’s been working alongside her famous sister as a Personal Assistant. It’s about time she got her big break! Make sure to come back here, to this spot, later tonight for our LIVE recap of tonight’s Blind Auditions! RECAP: The first audition of the night is Will Champlin, his father played in the band Chicago; Will was inspired from his father to become a musician. His father Bill says that some of the songs his son has written are amazing and believes it is his time. Will would love to be able to provide for his family with doing music; he wants to make it on his own. Will sings “Not Over You”. Blake hit his button and turns. Adam then hits his button and so does CeeLo. Adam says he has a really incredible voice; he believes everything was spectacular and would like to help him out. Blake says he loves him, he says it was very powerful singing with an amazing pitch. He believes that both him and Will could win it all. Will chooses Adam as his coach; Adam gets up and hugs Will. Up next is Macey Estes and has had music around her all her life; she always sang and danced alone at home but as she got older she realised that it was something she wanted to do with her life. She just graduated high school and is ready to show off what she’s got; she hopes she can make it on one of the judges teams. Macey is singing “The Way”. Nobody turns for Macey; Adam mentions how he knew she was young from her voice. He heard the potential but not sure if it could really make it. Christina said she has to push herself a little more with the notes. Macey mentions she loves rap and CeeLo tells her to rap; Macey raps and Adam loves it. They tell her to stay confident and that she is really good. Next up is Stephanie Anne Johnson and has been singing all her life; her grandmother introduced her to many different genres. In school she studied classical voice, she got a job on a cruise trip in Alaska. She plays the guitar and sings; she is always at sea for 8 months of the year and misses a lot at home. She is ready to get back on land; Stephanie is singing “Black Horse And The Cherry Tree”. Christina and CeeLo turn around. Adam says you can feel the attitude from her voice; CeeLo says it was a very great performance, he heard soul and conviction. CeeLo mentions that he could take her to number one. Christina says it moved her and she was really feeling it. Stephanie chooses Christina. Next up is Sam Cergnilia who has his own band doing acouple of gigs here and there; his family is very supportive of him. Sam has two sisters with diseases that really do hinder them; he loves his family and wants to do this for them and show them dreams do come true. Sam gets a message from his ill older sister and mother saying they wish they were there and they love him. [8:38:41 PM] Chris: Sam is singing “It’s A Beautiful Day”. Blake hits his button and so does CeeLo. Blake says that he tried to play it cool but says that he loved his sounds and range; he’s a complete vocalist but also loves his style. Blake is jealous, it was like a Michael Buble concert. CeeLo says he was singing so mature, it sounded like he was the perfect gentleman; he thought he sounded like a ladies man. Sam chooses Blake as his coach; Blake gets up and gives him a hug. Next up is Jennifer Newberry and is from Sweden, she lived in Sweden for a long time and loved the music in America. She really wanted to sing for a living, she sang in casinos and people were never really listening to her. She came to America to be successful; she is ready to take this opportunity. Jennifer gets a message from her family in Sweden telling her good luck. [8:50:25 PM] Chris: Jennifer is singing “Locked Out Of Heaven”. Nobody turns for Jennifer. CeeLo says that she is beautiful for damn sure; he was really close to hitting his button. Adam said there was some mistakes in some of the notes. Blake says that he felt like her voice is suited for a different type of music. Adam gives Jennifer a hug. Now we get a complication of singers who just did not wow or move the judges enough. Christina and CeeLo turn around; Adam and Blake follow. Blake says he’s so happy to see him again; nobody has never come back from not making it and had all 4 chairs turn for them. Adam says some things need some work but believes it was great. Christina says that his delivery was amazing; she pushed a little sooner than CeeLo and believes he could do anything and wants him on her team to win. CeeLo says that it’s a pleasure to meet him now and loves his quality; he was completely moved by his rendition. Blake says that whatever he did last time he auditioned was great, he’s now completely ready to win The Voice. James chooses Adam to be his coach. Next up is Olivia Henken and has been trying to get into the music business for years, she’s been singing and entered several contests in her life but still can’t land a career. Her family is very supportive of her and hope The Voice is her chance to shine. Olivia is singing “Two Black Cadillacs”. Christina hits her button and turns. CeeLo then hits his button at the end. Christina says she is glad she hit her button first, Christina says that Olivia has to be on her team; her voice connected to him. She wants a woman on her team to take it to the end. CeeLo says that he would challenge her to try different genres of music, he wants to test her waters. Olivia obviously chooses Christina, Olivia walks over and hugs Christina. Next up is Jason Kertson who is 16 years old, he became obsessed with playing guitar and figured out how he loved singing as well. He plays two guitars at once, his video on Youtube got a lot of views. His dad said he knew he was gifted when he surpassed his guitar playing at only 9 years old. Jason is singing “Lips Of An Angel”. Jason gets none of the coaches to turn. Blake is so surprised at his age and voice; he had no idea he would look like that. Adam says he sounds like more of a man than he would ever be. Blake says it was powerful in the beginning but it kind of went down as it went on. Christina says his maturity and tone in his voice is just amazing for 16. Next up is R. Anthony and is 33 years old; he was the quiet kid all his life; but in college he formed a gospel trio with his brother and his best friend. But when his wife got pregnant he had to focus on the family first; but his wife told him it’s time for him to go back into the singing world. R. Anthony is singing “Hall Of Fame”. Christina hits her button. CeeLo hits his button right at the end. Christina says that she believes in him, she really listened and loves how well he sang that song. CeeLo says he loved his performance and wanted to just experience it, so he turned at the end. R. Anthony chooses CeeLo to be his coach. CeeLo walks on over and gives him a hug. Next up is Justin Chain and he is 23 years old, his parents sang all the time when he was young and it kind of grew on him. In school he aimed towards sports more but he was in a motorcycle accident that ruined his chances of playing sports in his future, he had 500 stitches. He wants to inspire people with his music and would love to work with any of the coaches.Justin is singing “She’s Country”. Blake hits his button first. Blake gets Justin be default being the only one who turned. Blake calls the other coaches idiots and loves his pitch, none of them were even bothering to compete with him. Blake welcomes him and shakes his hand. Last to audition tonight is Ashley Dubose and she is 23 years old, it was her childhood dream. Her mother had her sing all the time loving her voice; she working full time as a programmer analyst and has been a single parent for 3 years. She feels like she’s spreading herself thin, it gets really hard and she keeps hoping some day it will get better; this opportunity means everything for her. Ashley is singing “Diamonds”. All the coaches hit their buttons and turn for Ashley. Adam says her voice cuts like a razor and her voice will make it far on the show; it just took over the room. CeeLo asks if she sings for a living, she says no and Adam says that she does now. CeeLo says she is an amazing vocalist; Christina says she just hit all the right notes. Blake says he seems like an unlikely choice but he believes he can make her become the best she could possible be since he did win three years in a row. Adam says she should could win and wants to knock off Blake from his throne. CeeLo says that his coaching style is very personal and he keeps in contact with all the contestants he works with. Ashley chooses Adam to be her coach.